It’s official; the new name of OCS is Lync! 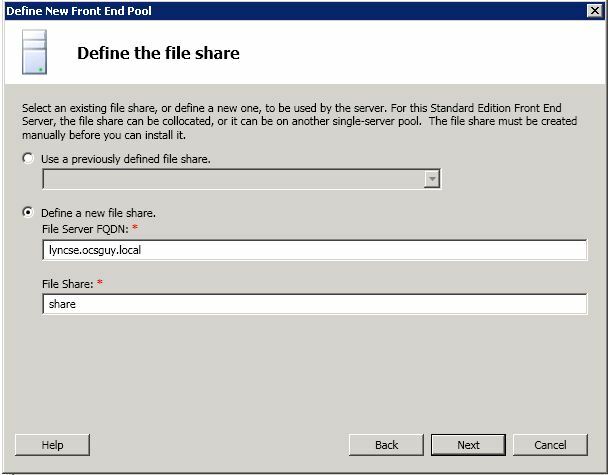 With the name change comes a number of new features including revamped management interfaces (Topology Builder, Deployment Wizard and CSCP) and a Management Shell with tons of great new scripting capabilities. 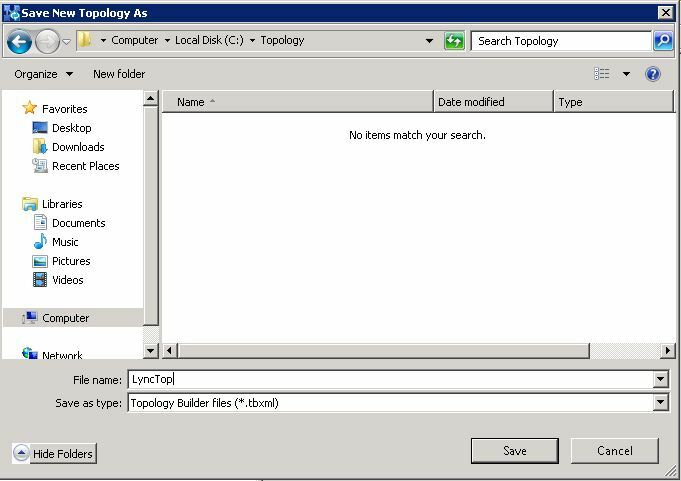 With all of these new features available, and a new way to deploy I thought it would be fitting to cover deploying a topology. To start things off easy we’ll jump into a single box Standard Edition pool. Over the next few articles I will add layers to this deployment until it resembles what you may want to use in your environment. 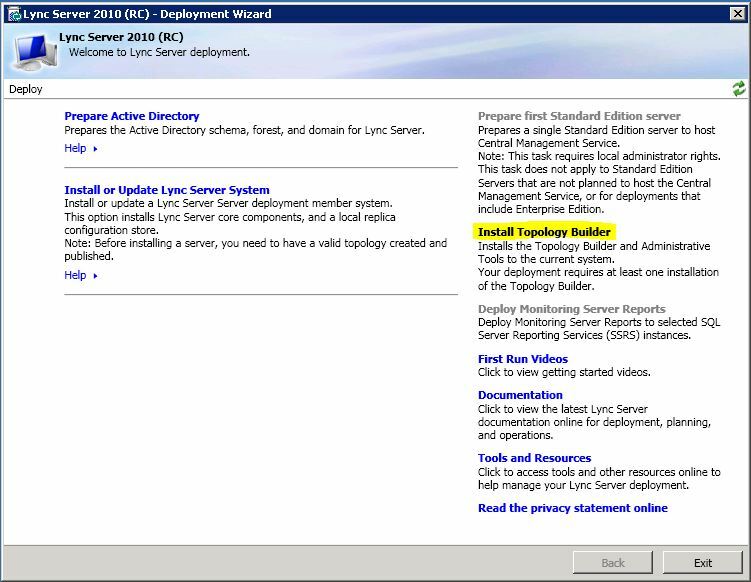 For this install you’ll need a DC/DNS/CA server (I named mine lyncdc.ocsguy.local), we’ll bypass that portion of the install to keep the article to a reasonable length. Here’s a quick ServerManagerCMD script to make that happen, to use this open a Command Prompt (Run As Administrator) and paste the information below. For formatting purposes copy this into notepad and make sure when wordwrap is unchecked it is all on one line. Now that we have the roles and features necessary we reboot to complete the installation and start the install. Click “OK” to install the vcredist package. After accepting the license agreement the install will begin. 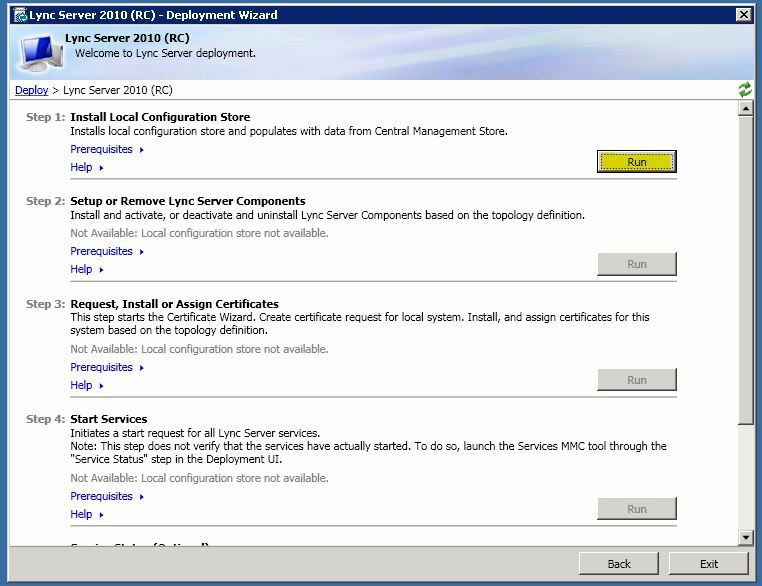 And onto “Prepare First Standard Edition Server”, this preps our new lyncserver to house the Central Management Store (CMS). Now our server is ready to host the CMS and we can start out with the Topology Builder. 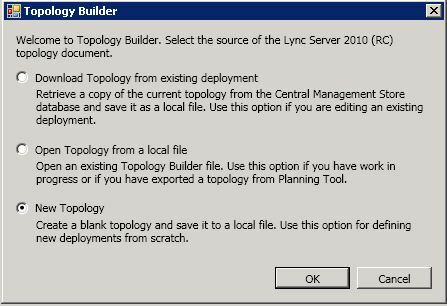 With Lync Microsoft has built a fantastic deployment configuration utility in the Topology Builder that allows you to create your entire topology all at once, and then it stores this topology in the CMS where each server can access it. 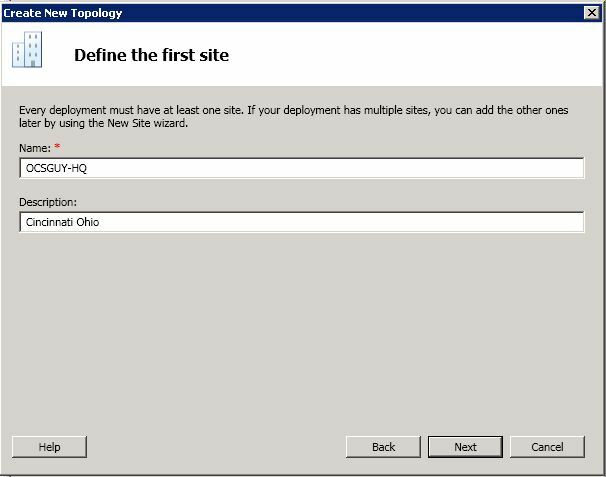 After the topology is published, you run the “Deployment Wizard” on each server and its rolls are automatically installed. I must say I really like this utility! 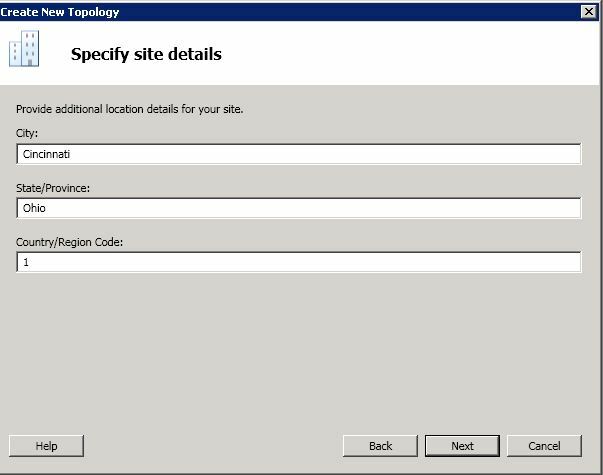 We are prompted to select a name and a location to save the Topology Builder XML file to (tbxml). 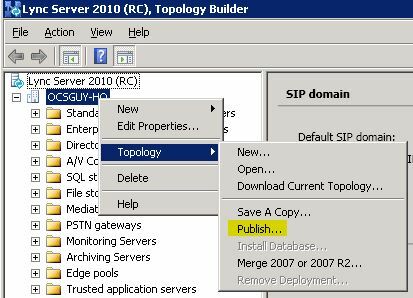 Each time we open the topology builder we will be presented with this same option, after publishing the topology the first time we will choose “Download Topology”. The great part of this is you can make a copy of this file every time you are logging in to make a change, in the event of an issue just grab the previous file and re-publish it. Now we are creating our topology, we start by defining our SIP domain. 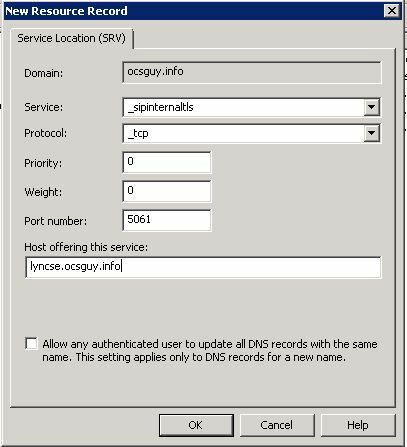 In this case I will be using ocsguy.info for the SIP domain, ocsguy.local is the internal domain name and will not be needed. 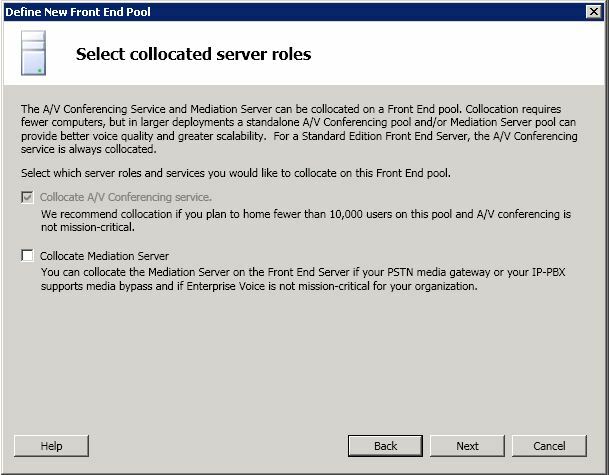 We select our features, bypassing CAC and the collocated Mediation server for now. 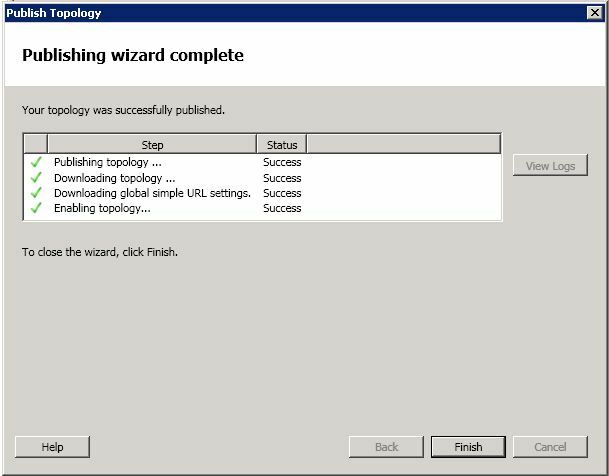 Once our topology is published, we need to go back into the Deployment Wizard and let the wizard configure our new standard edition server. 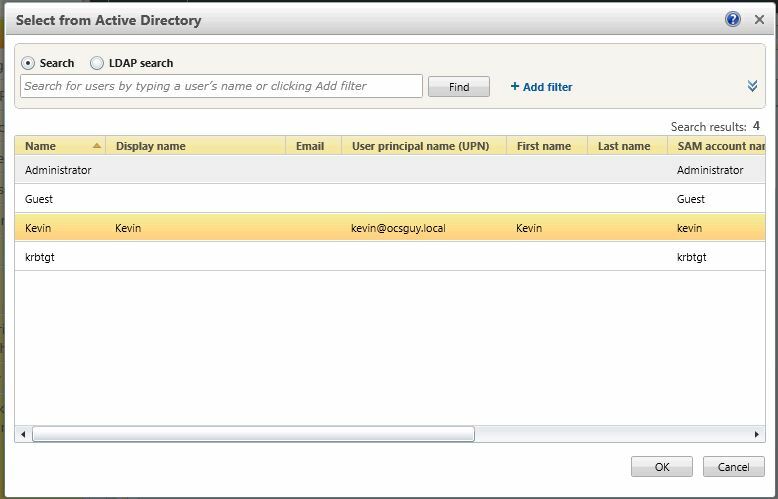 Before we can enable our first user, we have to add the “Administrator” account to some roles in AD, from ADUC right click the administrative user, go to properties and open the “Member of” tab. Add the Administrator account to the groups shown below. 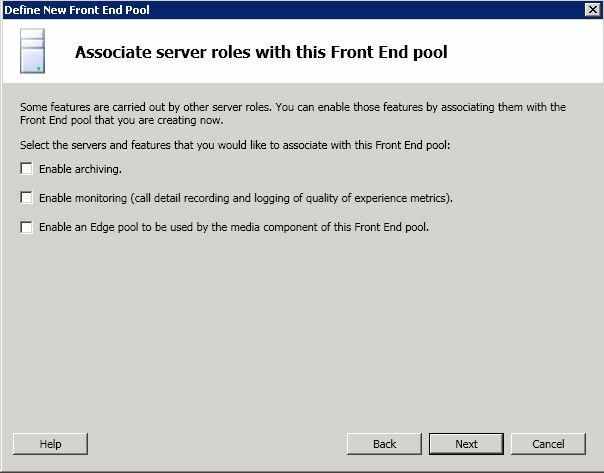 Next, log off and back on to the Front End server to let the permissions take effect. Now we can go out to our Communications Server Control Panel (CSCP). 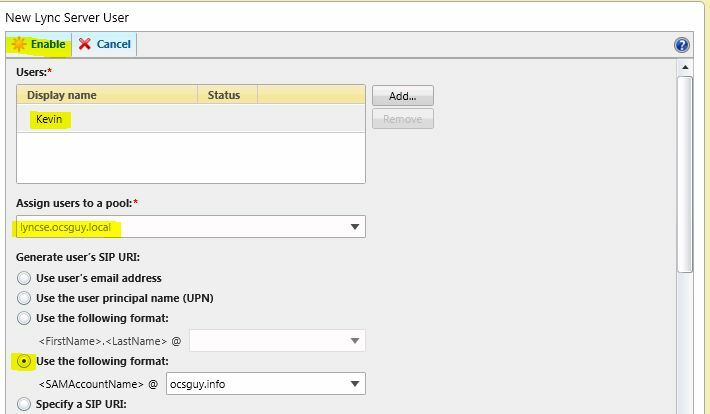 Since we haven’t deployed Exchange yet we can’t base the SIP address on the email address so I chose SAMAccountName, make sure to choose your public SIP Domain (in this case ocsguy.info) and not your internal domain. And last but not least, we get to sign in (if the computer you are testing from isn’t joined to the domain you will need to import the root certificate). 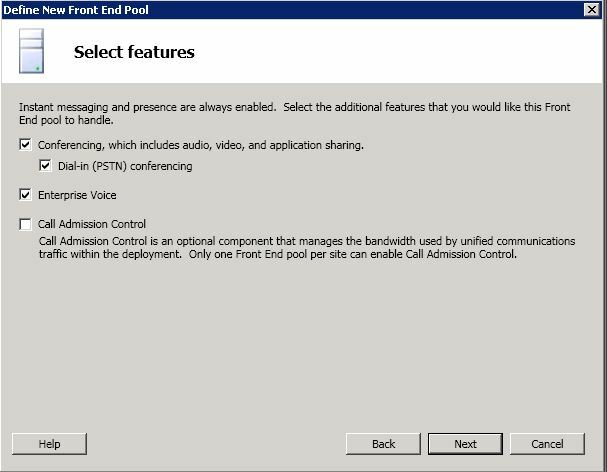 After enabling a few more users you can begon testing and learning all of the great new features of Lync. Check back soon as I will be going over the next step in the process, adding external connectivity. 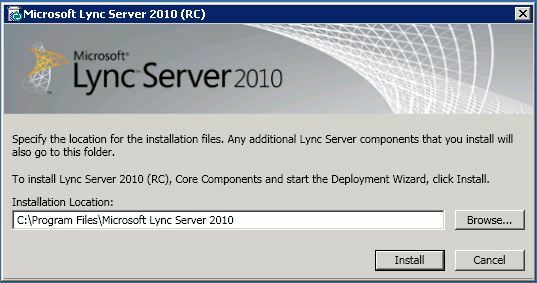 This entry was posted in Uncategorized and tagged Lync, Lync 2010, Lync Server, Lync Server 2010, Microsoft Lync, Wave 14. Bookmark the permalink. 70 Responses to Welcome to Lync! This was very helpful. I cant believe how much it has changed since R2. Thanks for taking the time to include screen shots. Are these new users, domain admins, etc? Any errors you can share? I’m checking right now if any of the suggested causes can be “The One”, but have found nothing sofar. Sorry again – delete that remark. 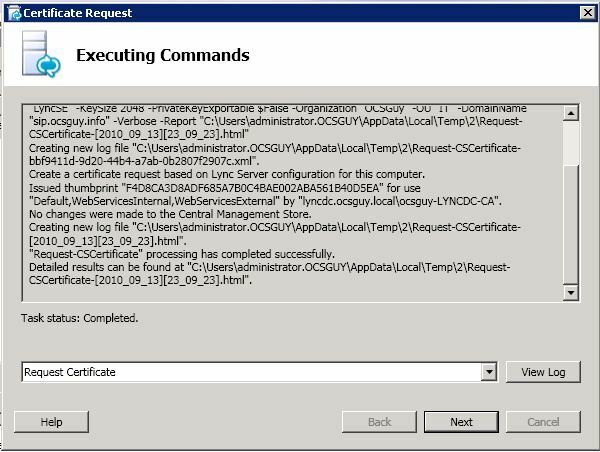 Of course it *was* in the Publishing wizard… Failure while Creating Central management Store. Did you already run the “Prepare First Standard Edition” server step? Am then trying to publish the topology and get the above mentioned error. SQL Server 2005 got installed and I can see that RTC is started with Shared Memory/Named Pipes/TCP/IP protocols enabled. Ensure that tasia.s.local\rtc is a valid SQL instance. 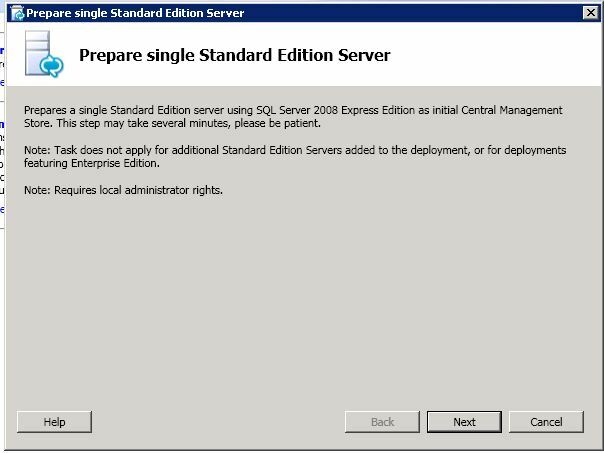 Possibly I will try installing SQL Server 2008 SP1 before continuing. Im getting the same error did u find out any solution for this?? I ran into the same issue as described above. I tried uninstalling all of my SQL installations, messing with the server config mgr, preparing first SE server multiple times and none of those worked. 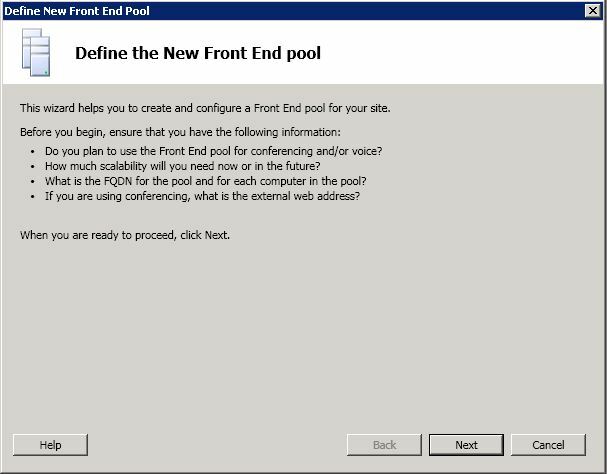 What my problem turned out to be was where I defined my primary front end pool. The pointer didn’t have the server name in properly. When SQL Browser service was manually started the error message changed to BAD_VERSION. Seems the cause of the problem is an old installation of SQL Server 2005 Xpress. 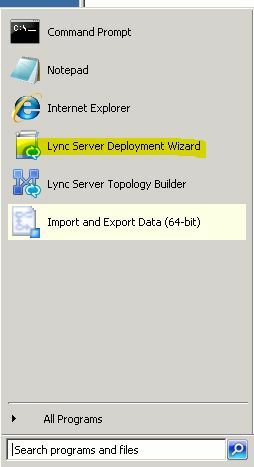 When it was present, the installation program didn’t install any SQL Server, and Lync can’t work with Xpress. 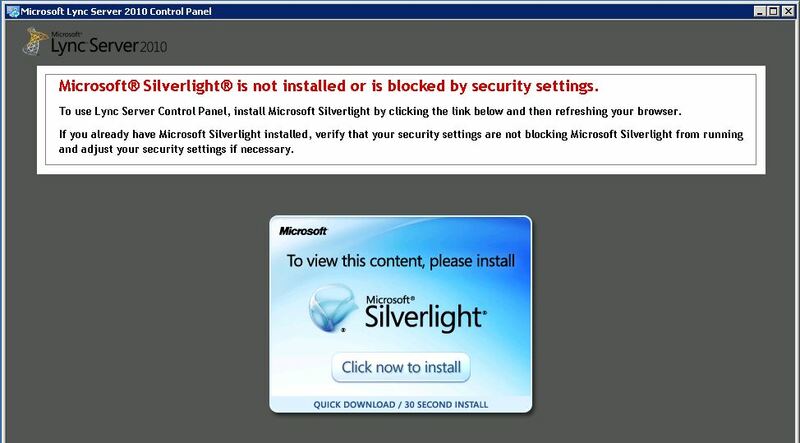 So it’s uninstall and installation of SQL Server 2008 SP1. I wonder if it’s then just to continue with Publish Topology or if (parts of) the already done Lync installation has to be redone? 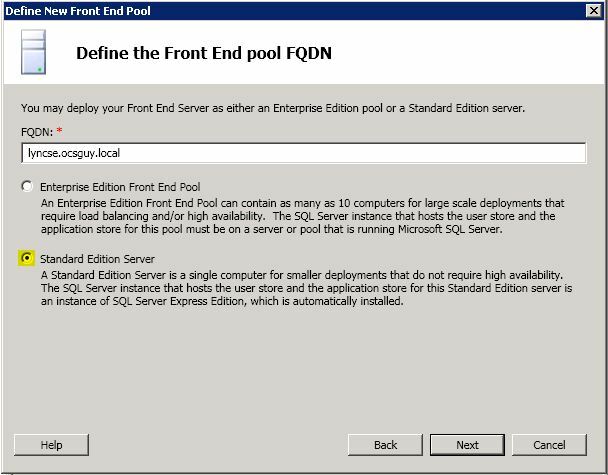 Yes, uninstall + install of SQL Server 2008 + rerun of “Prepare first Standard Edition server” fixed that problem and the Topology Publishing wizard completed with success. On to next step. 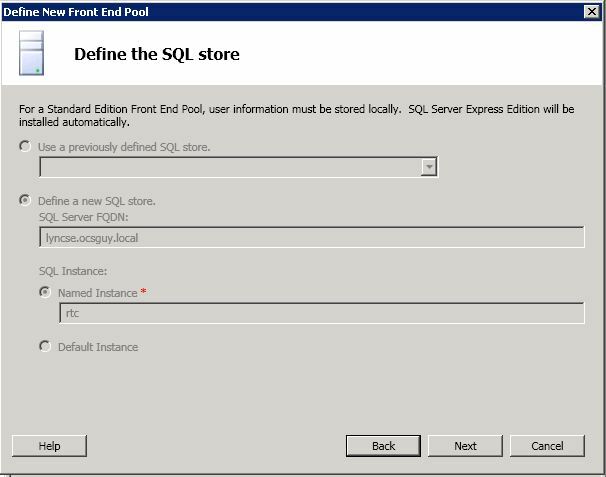 It sounds like you already had SQL installed ahead of time and that coule have been the root cause (please correct me if I’m wrong there). 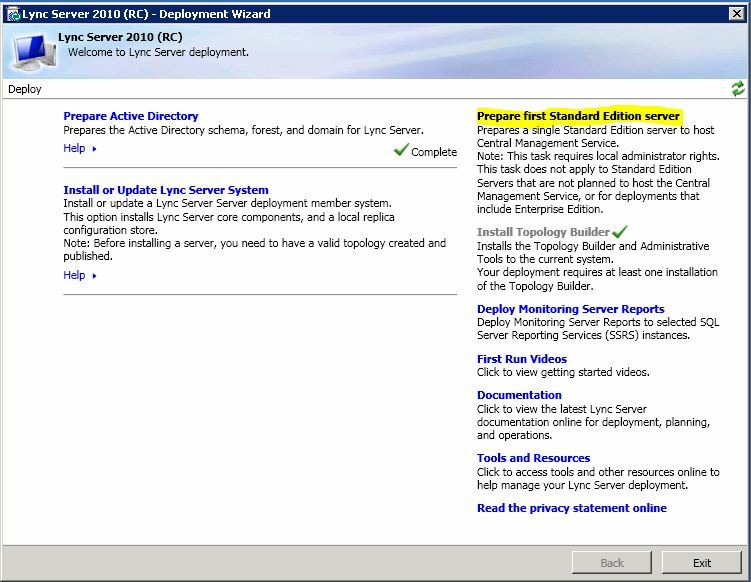 It is a good idea to only have the OS and any 3rd party apps (like Backup and AV) on the server and let the Lync installer handler the rest moving forward. Thanks for sharing what you’ve run into and how you corrected it! 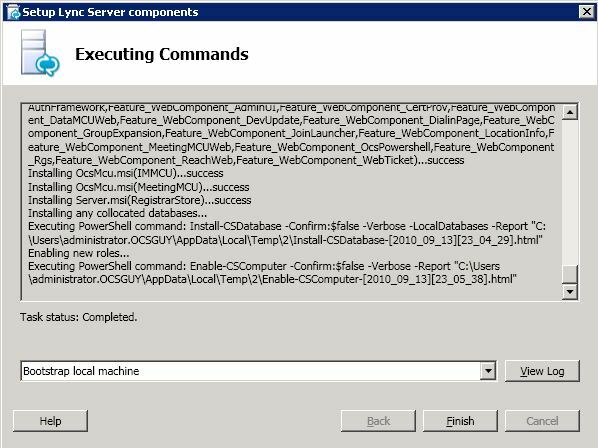 Yes, we missed the uninstall of SQL Server and the installation routine didn’t check for that the existing RTC instance was from a too old server version. It’s a lab server and I didn’t know if I could uninstall everything. 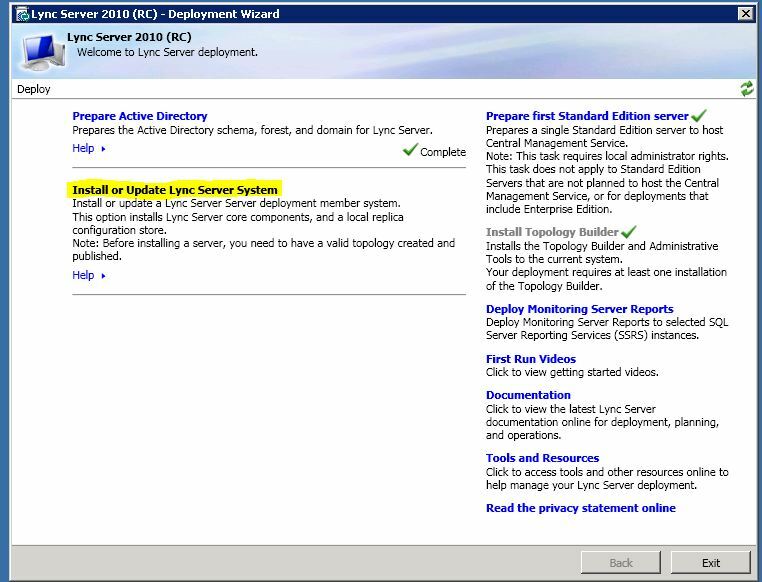 We have ocs 2007 r2 deployed and would to upgrade to lync 2010. 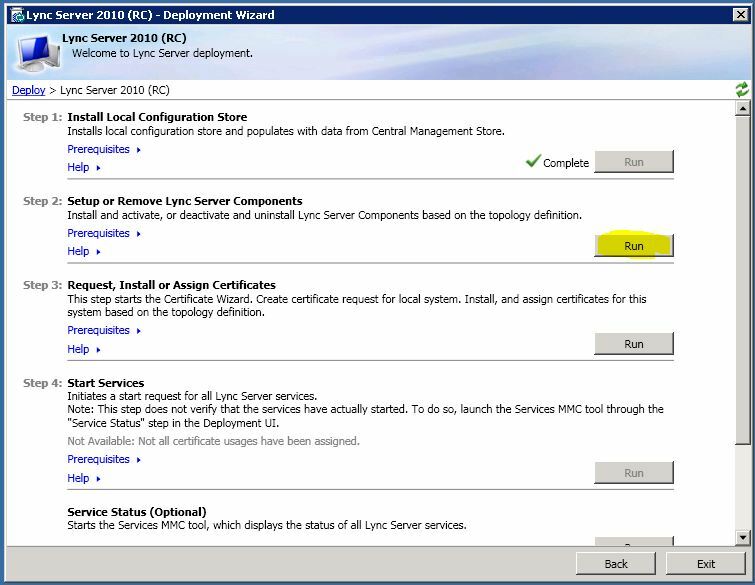 Can i install a new lync 2010 server into the existing sip domain? our current sip domain is sip1.net doamin is domain.local. 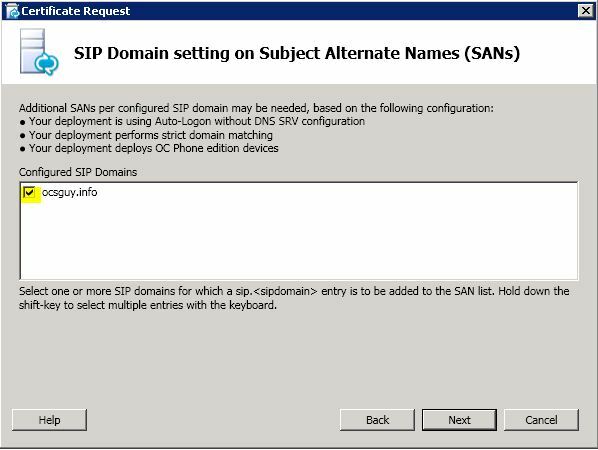 Rather than have to reconfigure all the external connectivity it would be great if we could install a lync server using the current sip domain name. 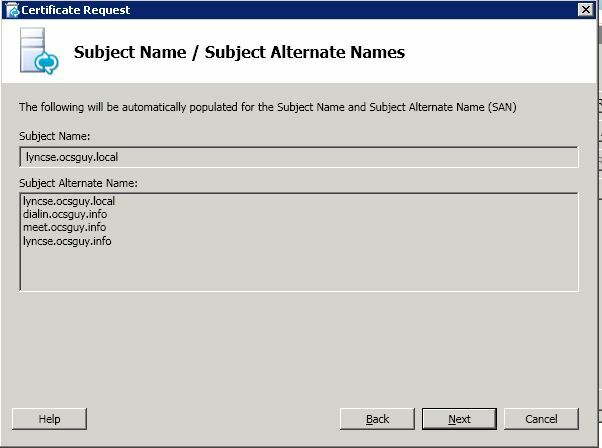 Lync isn’t available yet (unless you use a time bombed version), but once it is GA you will definitely be ablle to install it into your existing SIP domain and migrate from OCS 2007 R2 to Lync. I’ve run through that scenario a number of times and it works well. There should be some great documentation availably shortly that will help you plan this. Keep a close eye on Technet. It’s very userful blog,I am very happy to read this blog. Have you run the “Prepare First Standard Edition” wizard and also logged off and back on after granting your install account the permissions show above? 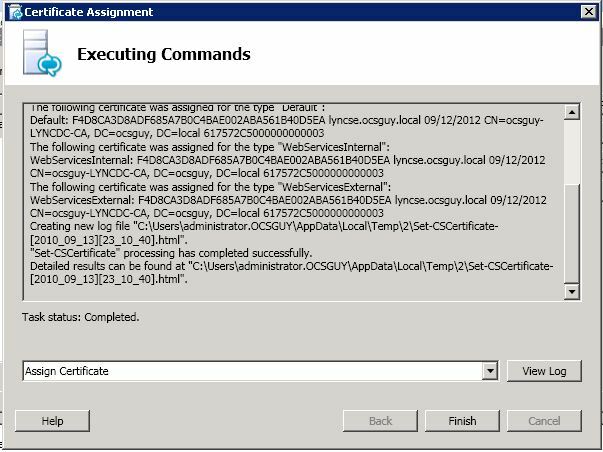 Im getting this error “Upload C:\Program Files\Microsoft Lync Server 2010\Deployment\Setup\ExternalSchema.ldf fails. The exit code is “8206”.” how i can solve this problem? Please make sure your account is a domain admin, enterprise admin and schema admin. Also, try rebooting the box after adding these permissions. I had this same error message and the user account had all of these permissions. 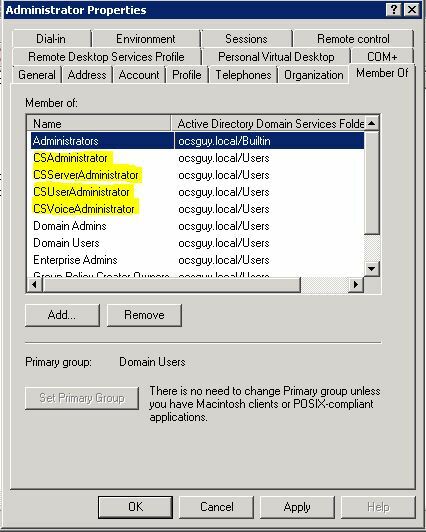 What ended up being the problem for me was that I had an old domain controller still in active directory that it was unable to contact or replicate to. 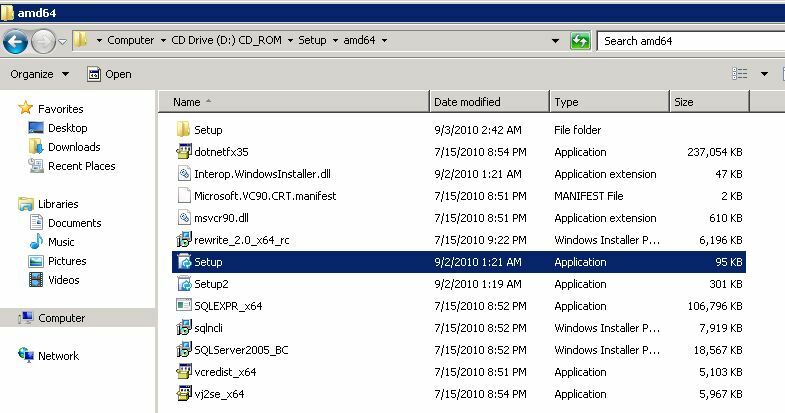 To resolve it in Windows 2008 I went into ADUC and deleted the DC. For Windows 2003 you will need to refer to the Microsoft documentation on how to delete an old DC. 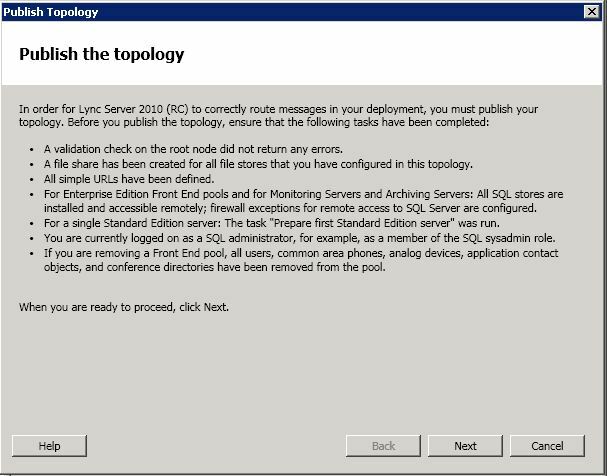 Sorry to bother you…I’m trying to deploy LYNC on server 8 beta and am also having the 8206 exit code. I’ve checked my account, enabled remote registry changes, enabled schema manipulation with no luck…any other ideas? 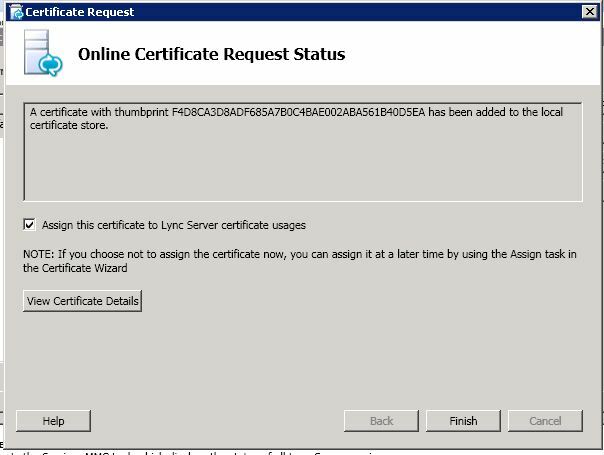 Hi Ricardo, I’m not sure it is currently supported to install Lync on the server Beta and I haven’t tried. May be best to deply on server 2008 R2 until MSFT has documentation on what is required for Server 8. Please try a DCDiag and double check that you are logging in as test.local\administrator and not just administrator. Hi there, I’m having trouble migrating from LCS2005. I’ve managed to hurdle the idiosyncrasies through 99% of this (thank you so much!) but I’m struggling on the DNS section as none of my clients can log in. I’m effectively disabling live communications for everyone, then re-enabling (I’ve moved servers) using the lync server manager. also, your ip: 172.16.5.151 – where is that from? Do you have an SRV record of _sipinternaltls._tcp.domain.com matching your SIP domain? the 172.16.5.151 was just a fee IP in my lab space at work that I assigned to the server. I do yes – however that’s a side that I didn’t initially set up so I haven’t changed a great deal (we used to have LCS2005 with Windows messenger which is due to be decommissioned due to a Win7 upgrade). I’m looking through to see if there are any conflicts with an existing (stopped) server for LCS2005. The ports set up for that are [_rvp @ 80], [_sip @ 5061] & [_sipinternaltls @ 5061] – could this be the issue? 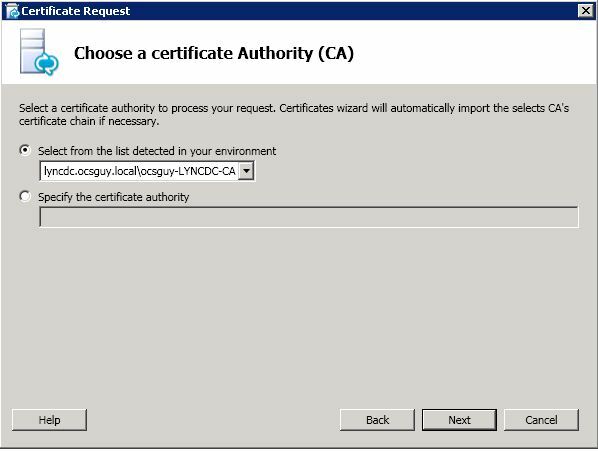 Everything else seem sto check out ok.
I´ve copied the certificate already from the CA to the Client. Please make sure the name listed in your SRV record is in the SAN fields on your certificate applied to your pool. I was really having some difficulties with this installation as it is very different to the Communication Server installations that I’ve done previously. Everything was fine until I recieved the error “Automatic collection of configuration data failed.” and have spent several hours trying to resolve this with really no luck. You have saved me hours of further headaches. Cheers! Hi, I am new in Microsoft Lync 2010 and all about Communicator. 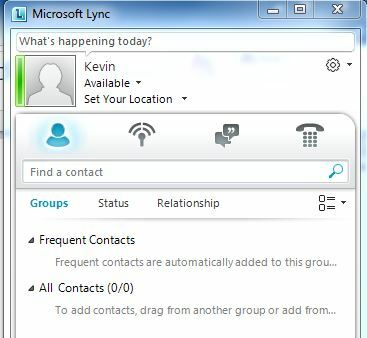 I have recently installed Lync 2010 to evaluate (Evaluation 180 days) and I installed it in my corporate network. My boss ask about to configure to can connect from internet and capabilities to sharing witth other clients like msn messenger or google. Otherwise we have two Mac clients that we want to connect. Questions: I need some procedures as easy possible to carry on Lync internet connection and I want to connect Mac clients. My configuration is one servers with Microsoft Lync 2010. I have a DC, DNS. You will have to at the least deploy an additional edge server for public connectivity to work. Great guide. I have one question hopefully someone can help me with. I installed this inside a resource forest and everything is working except the fact that I can’t see outside of a single OU. I stood this up next to a 2007 R2 install, and want to move everyone to the new pool. 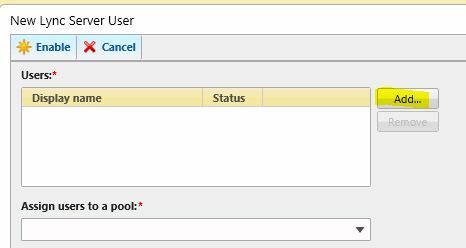 We have multiple OU’s and the only one i can see when i try to move users from the control panel is the default OU of “Users” and only the users within that OU. My work around is to move the user from their current OU to the default “User” OU, and then move them to 2010. After I move them I then move them back to their original OU. Again, just a work around but painful for over 100 users. I’m looking for a fix moving forward that will allow me to see the entire Domain and not just the “User” OU. Any ideas? 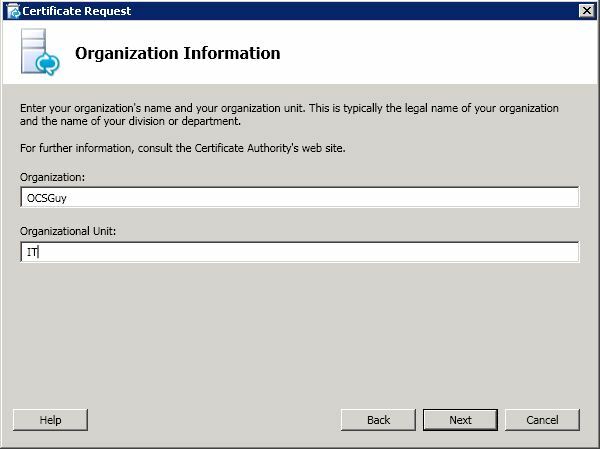 (I checked security over and over, in OCS 2007 this wasn’t an issue because of the snap in, I could just do it right from the user account). Any help would be appreciated. I had an error in ” Publish Topology ” step. 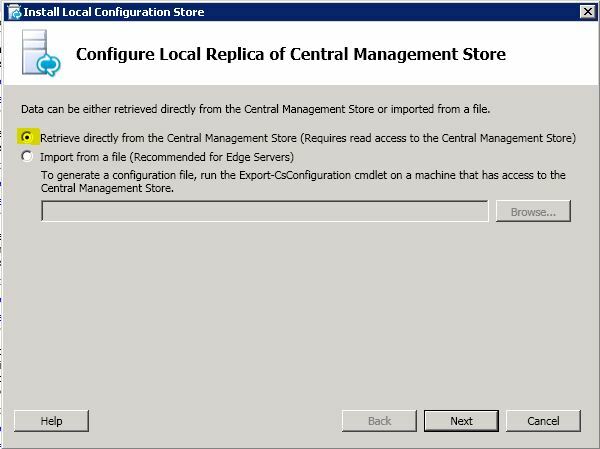 I cann’t create Central Management Store (Status : failure). 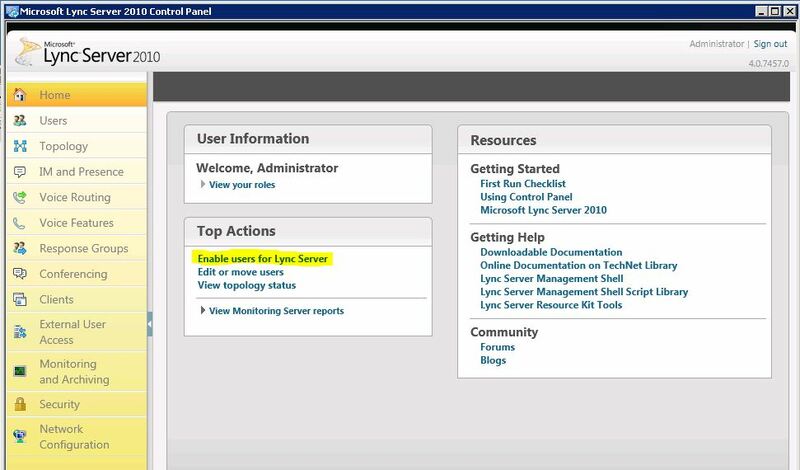 Can be done using “Lync Server 2010 Control Panel” under “Users” where you have option “Enable Contacts”. If I use this option, no contact from AD will show up. Have you already run “Prepare First Standard Edition Server” for the first server? 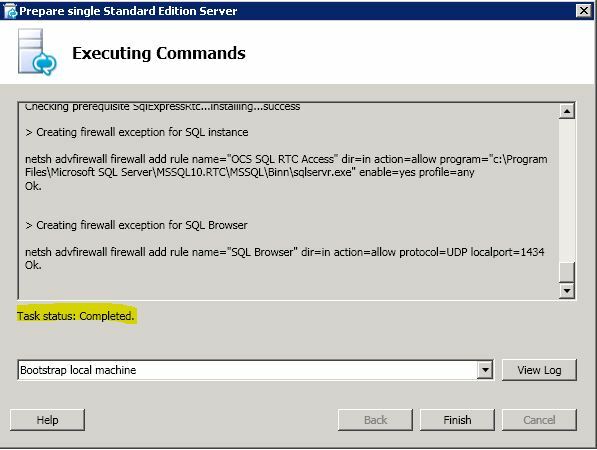 If so please verify the RTC instance of SQL express is running and maybe try turning off the firewall as a test. Hi there, fantastic article and it helped a lot with our installation of Standard edition! I made it all the way through the install with no problems, configured the SRV record, but none of our users can log it. It just says (Communicator) the password is incorrect or the sign-in name does not exist. Any ideas as to what might be causing this problem? By chance are your users using XP or Vista? Great article. 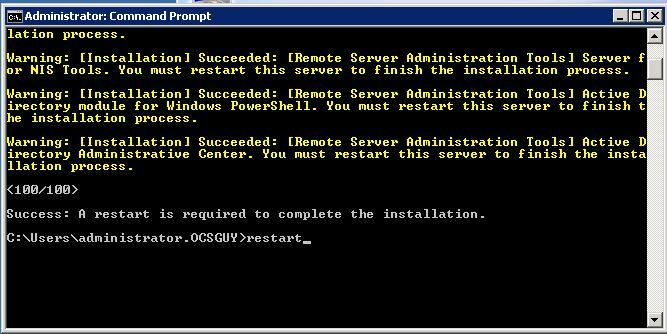 Just followed it to build my own Lync VM. Many thanks. I like this post, is a very comprehensive article. However, in my implementation I get an error when publishing the topology. I hope that maybe you could help me. Hi Kevin Peters, great post. Worked out perfectly on my 1st attempt at deploying our 1st Lync server. Please explain to me the procedure to import the root certificate. Hi, thanks for this document. 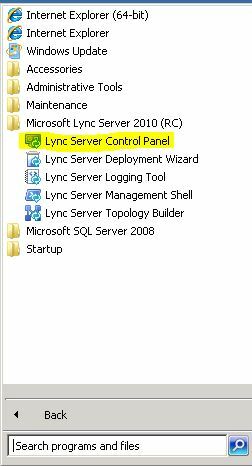 I have a problem for connect to a Lync panel control. Are you trying from the server? Maybe try browsing to the website https://servername/CSCP from a client computer. 1. 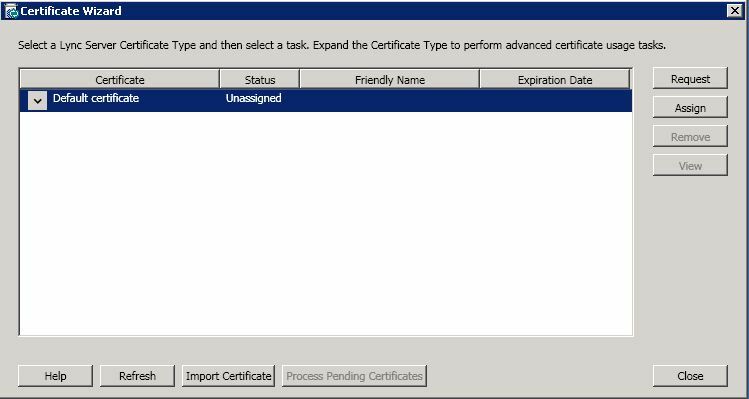 What are the permissions that the user that installs Lync are needs? 2. 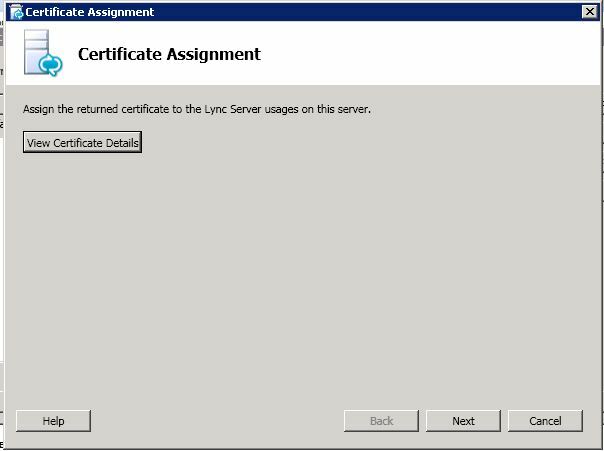 What are the user permissions needed to install a second Lync server to a domain other than the one that hosts the CMS? 3. What are the permissions needed for the shared folder created? I know that Lync installation is setting these permissions, but is it like Full right for installer user and read only for others, or is it something more specific? Awesome article. Thanks so much. 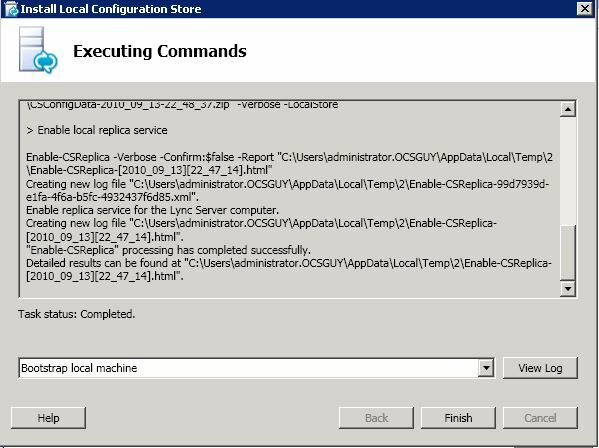 I had zero experience setting up OCS/Lync, and this totally set me up. Really appreciate the effort on it , I am deploying lync 2010 in my organization. 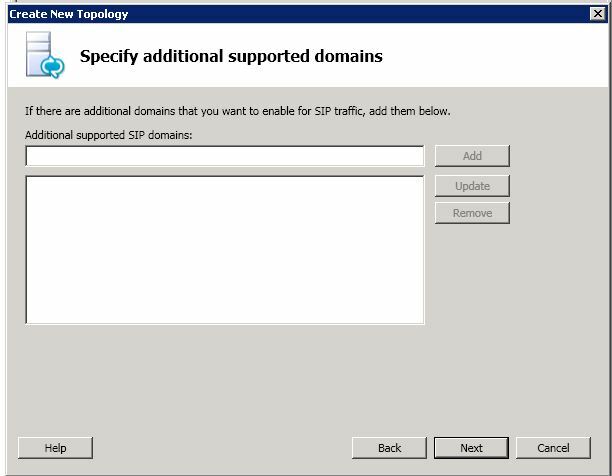 Please let me know what exactly SIP domain ? 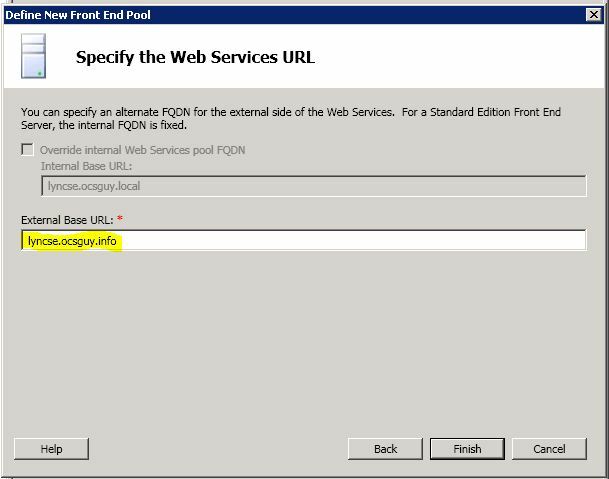 If my domain name is example.com.qa , can I use same for SIP domain .. Your sip domain in most cases will match your email addresses. You can use example.com.qa from your example above assuming you own that domain publicly. Thank you soo much Kevin , I just deployed fully functional lync 2010 and I got appreciation mail form my Manager 😀 ..I didn’t even read a single article apart from this ..I was able to achieve this without even a single technical road block ..this blog is really helpful ..looking forward to publish Lync in internet..
i have setup everything on my lyncsetup. 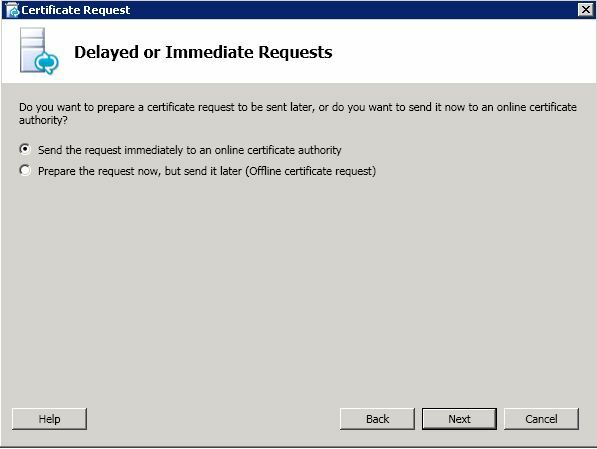 all my lync features are working fine except dialin.domain.com is not opening. i have public dns entery and also nating for the same. if same url i opened with https://dilain.domain.com/dialin its working fine. not sure how to redirect this and work externally. I’m not sure if you covered this but I have an error when publishing my topology. 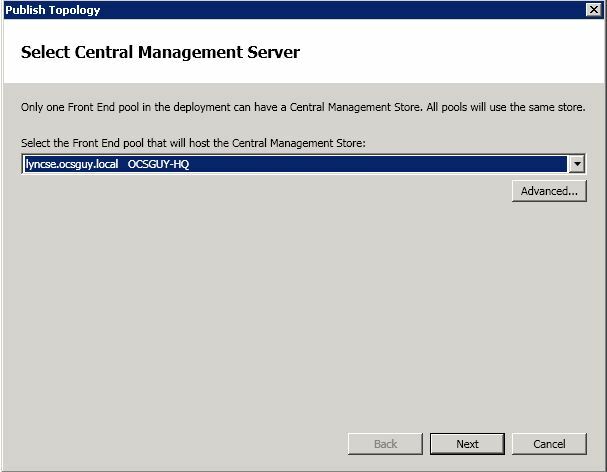 The error shows Creating Central Management Store- Failure. I’ve re-created the topology , opened ports on the internal firewall. What am I doing wrong? 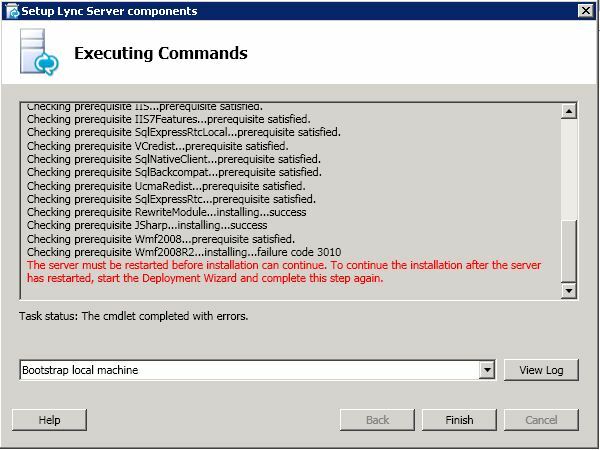 Did you run the “Prepare First Standard Edition Server” step on the main screen of the deployment wizard? So I figured it out. I thought I named the topology the server name but didn’t (mail instead of mail1) Duh! Great blog!